Emerging or smaller organizations often work within informal organizational structures due to lack of financial and human resources. This commonly results in fewer staff members performing multiple functions. With this sort of multi-tasking, it is imperative that key employees of such organizations are equipped with basic skills on managing human resources, operational and financial functions of the organization to ensure consistent efficiency and productivity. To support small and medium civil society organizations and local NGOs to achieve this level of efficiency and quality management, Community World Service Asia conducted a capacity enhancement opportunity through a four-day workshop on Organization Management this July. What did the workshop aim to achieve? 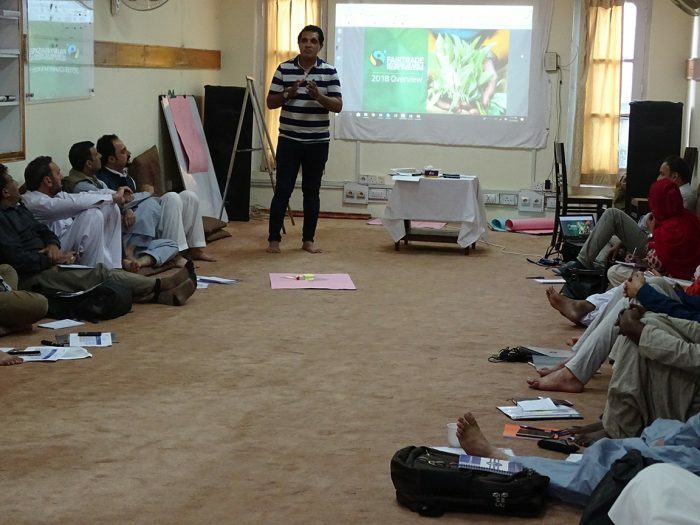 The prime focus of the training was to strengthen the capacity of local level organizations directly engaged in community mobilization and on-ground development initiatives. The key topics covered were Organizational Sustainability, Management Style in Different Cultures, People Management, Art of Planning and Implementation and Applied Tax Compliance. A total of twenty-four participants from fourteen different organizations took part in the workshop. 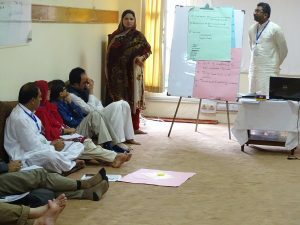 Once the participants for this training were selected, they were fully taken on board with the conceptualization, designing and activity planning of the training itself. Through an e-meeting, they were all asked about their expectations from this training and what they actually wished to take back from it. At this meeting, participating organizations particularly highlighted the need to include dedicated sessions on Applied Tax Compliances, Linking CHS with organizational management and Shrinking Space while working in sensitive environments. For these sessions, experts were invited to share their learnings and experiences in their specialized fields. A baseline survey was also conducted to assess the limitations and priorities of all participants prior to the training. There is a growing demand to adopt to international standards and protocols. Donors are pursuing the agenda for linking the organization policies, procedures and practices with international standards for quality and accountability. 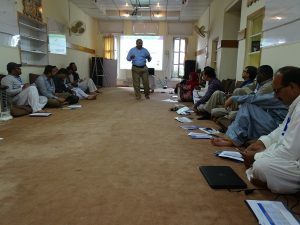 Local level organizations have shown deep interest in the pretraining stage to understand Core Humanitarian Standards and its significance for organization working in Pakistan. Community World Service Asia being focal partner of Sphere and an active member of CHS Alliance helped organizations in the workshop understand the importance of CHS and linking it to organizational management. Rizwan Iqbal and Sana Basim, in-house Trainers, briefed the participants on how to link CHS nine commitments with organizational policies, procedures and practices. The biggest challenge NGOs in Pakistan face is the shrinking space to operate. The problem associated with this is the lack of information about the factors behind the shrinking space. This is another area where CWSA is vigorously engaged. Karen Janjua, Associate Regional Director (Strategy and Partnership), was the guest speaker for this session. She shared the global and national factors behind the shrinking space like the Financial Action Task Force (FATF) recommendations to counter terrorism funding and newly introduce national legislative measure for this. She also shared the importance of working together and need for positively engaging with government. The participants appreciated the step of Community World Service Asia in introducing them to national and international legislations and how to improve the situation. There have been a lot of changes in tax and financial protocols for NGOs by the state in Pakistan. According to the participating NGOs, they face the problem of identifying tax rates, deducting taxes and filing returns. Hira Saeed from the Finance department in Community World Service Asia, briefed the participants about the FBR tax reforms in recent times and their implication on NGOs sector. She also shared the tax slabs for different categories. Practicing the blended learning approach, the facilitators’ team divided the participants’ group into two. The first group was asked to develop a short presentation on their organizational sustainability model, while the other group was asked to present their management structure as part of the session on Management Style in Different Cultures on day 2 of the training. 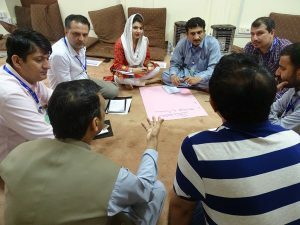 Since participants from same organizations were assigned different groups, each participating organization was able to share their sustainability model and management structure by the end of the session. The purpose of this activity was to promote peer learning and sharing of contextualized best practices through open discussions, one-on-one talks and formal presentations among various organizations. 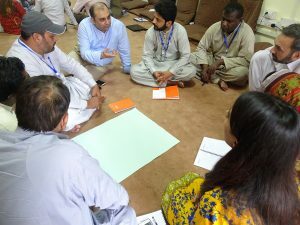 Participants developed organizational action plans, chalking out the roadmap for implementing the learnings of the training and the post-training support they would require towards the end of the training. They all requested to share their respective action points within their organization before agreeing on the final points. This was agreed upon and a follow-up questionnaire was decided to be shared among all training participants to complete in liaison with their line managers and senior management. Chaudary Shafiq, Commissioner at the National Commission for Human Rights, participated as chief guest at the closing day of the workshop. He commended the significant role played by national and local organization in Pakistan towards highlighting the issues of the underprivileged and underserved communities in Pakistan.